This watercolour is credited as the first Australian work of art to enter the Gallery's collection. It was commissioned in 1874 by the trustees of the NSW Academy of Art at a cost of £50, and in March 1875 was awarded a gold medal for watercolour at the NSW Academy of Art exhibition. 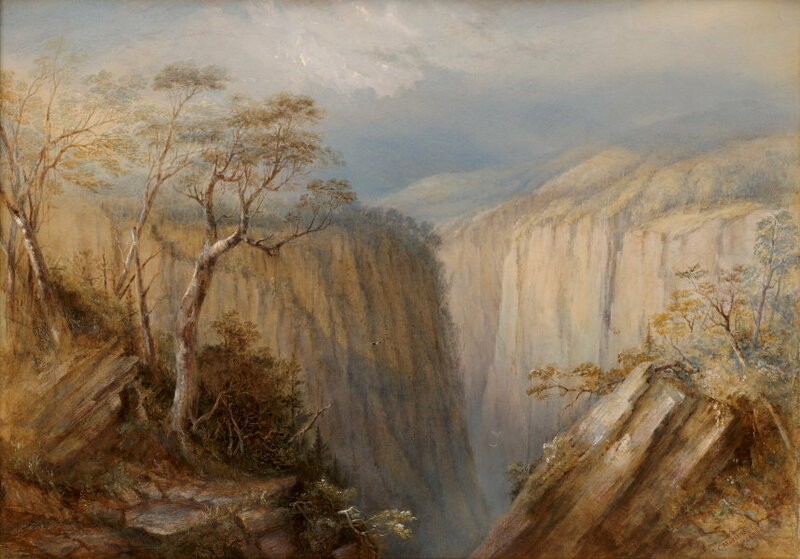 It is slightly larger than an earlier commission (made in 1873) for another Apsley Falls watercolour by the trustees of the National Gallery of Victoria, Melbourne. Both watercolours were made from drawings Martens produced in 1852, on a trip to northern NSW and Queensland. Martens referred to the watercolour in his Account Book (State Library of NSW) and again on 28 October 1874: 'On the Apsley River. Size 31 x 22 for the Academy'. The Apsley Falls are on the Oxley River near Waterloo, between Walcha and Port Macquarie. Signed and dated l.r. corner, brown watercolour "C Martens/ 1874". Helen Campbell, Look , 'Waterfall: an inspiration to travellers and artists', pg. 19, Sydney, Jun 2006, 19. Hendrik Kolenberg, 19th century Australian watercolours, drawing and pastels from the Gallery's collection , 'Introduction', pg. 6-16, Sydney, 2005, 6, 7 (colour illus., detail), 34, 35 (colour illus.). Hendrik Kolenberg., Twentieth century Australian watercolours from the collection , 'Introduction', Sydney, 1989. This work was not in the exhibition. Hendrik Kolenberg, Look , 'Australian images from the past: whether rarely seen or familiar, these works move and delight us', pg. 24-27, Sydney, Apr 2005, 24. Henrik Kolenberg, Australian watercolours 1880s to 1990s , 'Introduction: Painting in watercolour', pg. 8-16, Sydney, 1995, 13. Barry Pearce, Australian art: in the Art Gallery of New South Wales , 'Introduction', pg. 10-16, Sydney, 2000, 12, 18, 27 (colour illus. ), 301. Barry Pearce, Art Gallery of New South Wales handbook , 'Australian', pg. 13-35, Sydney, 1988, 13. Barry Pearce., Hemisphere , 'Conrad Martens, the traveller who stayed', Sydney, May 1982-Jun 1982, 4 (colour illus.). Daniel Thomas, Art and Australia , 'Australian collection', pg. 52-62, Sydney, Jul 1972, 53, 54 (colour illus.). Fourth Annual Report of the New South Wales Academy of Art 1874-75 , Sydney, 1875, not paginated. listed in Appendix under 'Water-Colours', Society's Gold Medal, No. 87. - Conrad Martens, artist, NSW. Art Gallery of New South Wales Quarterly , Sydney, Oct 1963, 165 (illus.). Fourth Annual Exhibition of Works of Colonial Art 1875 , Sydney, 1875, 8. cat.no. 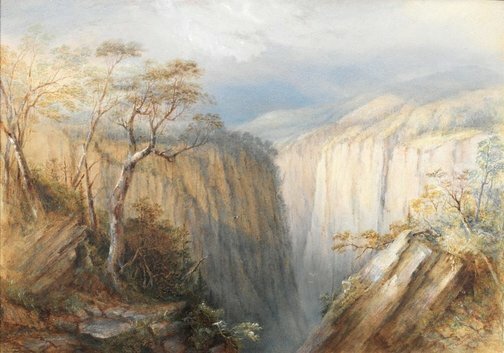 87; titled 'View on the Apsley Ranges, New England', painted by Conrad Martens, 'Painted for Trustees of proposed "Gallery of Art", Sydney'.